PhD Candidate at the Forest and Nature Conservation Policy Group (FNP) - Wageningen University (Netherlands) Sponsored by the CAPES Foundation (Brazil). Sustainable Forest Management (SFM) implementation strategies articulate different aims, goals, and interests across different scales of governance and social-ecological contexts. When SFM is implemented in common pool or public forests, governmental initiatives play a central role in defining formal institutions that will interact with the local social-ecological context. At the same time, local actors’ practices on governing common pools forests are also a key-factor in SFM implementation. This paper analyses, through a critical institutionalism lens, how interactions between a new set of formal institutions with pre-existing local institutions result in (un) expected governance outcomes when implementing SFM on the ground. Using the Caatinga biome in Northeast Brazil as a case study, it shows how local actors (bricoleurs) perform institutional bricolage processes by rejecting, adapting, or integrating institutions linked to SFM implementation strategies to their social-ecological contexts. The paper is based on a qualitative data analysis from twenty interviews with local and governmental actors, and nine site visits to rural settlements and industries. The analysis leads us to conclude that formal SFM institutions in Caatinga do not dialogue with all the different roles that forests resources have in the livelihood of local actors, but rather have a dominant focus on the production of forest biomass for energy supply. Moreover, we found that the success of SFM implementation is highly dependent on the interactions amongst local actors within the social-ecological context. Accordingly, positive results are only achieved when these interactions help to face challenges, specifically those linked to bureaucracy and to technical capacity. Keywords: critical institutionalism , institutional bricolage , Sustainable Forest Management , Caatinga. Sustainable Forest Management (SFM) is currently part of different environmental debates on global, domestic, and local scales (IUFRO 2009; Locatelli et al. 2010; Wagner et al. 2014). Global debates influence domestic policies linked to SFM via international markets and institutions (rules, norms, and cultural beliefs), and via direct access to policy-makers (Bernstein and Cashore 2012). Within a domestic context, however, institutions are strongly shaped by how forest resources are used and governed by different groups of local actors (Ostrom 2009; Hinkel et al. 2014; McGinnis and Ostrom 2014). Thus, the international concept of SFM is strongly shaped by regional and local contexts. In many places where SFM is implemented, forests represent a common pool resource that is considered public property. Therefore, state actors are considered to be key to the sustainable management of forests. While state policies and institutions have often been part of the loss and deterioration of common pool resources, the right type of policies and institutions, according to many scholars in common pool resource management (Richards 1997; e.g. Ostrom 1992), can also prevent forest degradation and loss. Local communities are increasingly recognised as a key factor to the success of SFM or similar forest management schemes that seek to attain both social and ecological objectives, including Community Forest Management and Participatory Forest Management, amongst others (Persha et al. 2011; Arts and de Koning 2017). The role of local communities in forest management, including SFM, continues to be underestimated in policy implementation in many regions (Agrawal 2007). Social networks and learning processes are important for integrating conservation of forests with local livelihoods (Arts and de Koning 2017), but are often not integrated in policy programmes. Scholars also increasingly emphasise the need to consider ecological context as interlinked with social networks when assessing the effectiveness of common pool resource institutions, defining it as a social-ecological context (McGinnis and Ostrom 2014). Specifically, SFM programmes should more explicitly address multiple forms of local resource use, governance, and traditions, rather than only trying to implement globally agreed upon principles of SFM (Rametsteiner 2009). Many scholars point out that sustainable forest outcomes strongly depend on the extent to which formal organisations and local community networks interact (Agrawal et al. 2013). More practically, the question is how external interventions by states or other (transnational) actors, such as the Food and Agriculture Organisation of the United Nations (FAO) and the Global Environmental Facility (GEF), connect to local livelihoods and their social-ecological contexts (Cleaver 2012). For example, Barnes et al. (2017) found the success of interventions in community forestry in a region of India to be related to how well these interventions connected to the livelihood portfolio of communities. These portfolios also represent specific forms of resource use that are related to the specific socio-ecological contexts the communities are part of. In another example, Le Tourneau and Beaufort (2017) found that for common pool resource management in the Amazon, the support of local social networks, such as the Chico Mendes movement, was crucial to maintain community management after external interventions end. In the Caatinga biome of Brazil, academic research on SFM has been carried out since the 1990s, yet a majority of it has a technical focus on forest resources as biomass for energy supply (Riegelhaupt et al. 2010). Some more recent studies do focus on other forest issues, including Non-Wood Forest Products (NWFPs) (Pareyn 2010) and forest as a natural pasture for animal rearing (Bakke et al. 2010; de Araújo Filho 2013), but such studies are rare. Moreover, a social science perspective on SFM implementation and common pool resource use is mostly lacking for Caatinga. So, little is known about how local communities are included in SFM implementation and how their various forest uses are considered in government strategies related to issues such as biodiversity conservation, climate change mitigation and adaptation, desertification vulnerability, and poverty. 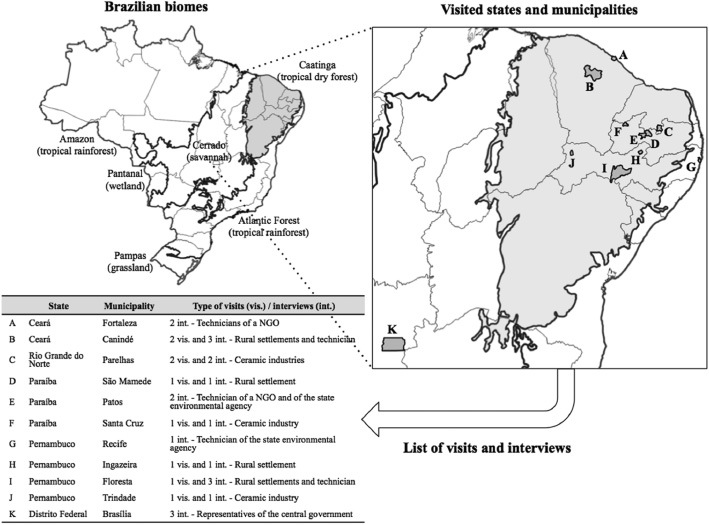 This article focuses on how formal and state institutions linked to SFM implementation strategies in the Caatinga biome of Brazil interact with a pre-existing set of local institutions (Cleaver 2012; Cleaver and De Koning 2015) within a specific social-ecological context; and to what extent these interactions shape forest governance outcomes and forest practices on the ground. In particular, we highlight how such ‘bricolage processes’ take place in the interactions between multiple actors who represent different types of resource use and the resource system itself (Ostrom 2009). Below, we discuss our analytical framework and methods, after which we discuss how the themes of legality, social organisation, and technical capacity are focal points of bricolage processes in the implementation of SFM in Caatinga. We conclude to emphasize the importance of considering local networks that include, but also extend beyond, local communities and a broad range of forest uses when introducing SFM institutions. Institutions are understood as a set of formal or informal rules, norms, and cultural beliefs that guide actors’ choices and shape actors’ behaviour (Arts and Buizer 2009; Scott 2010). While a key characteristic of institutions is that they are generally stable over time, they are equally subject to a constant process of change across different scales of governance and space (Cleaver 2012). Critical Institutionalism (Cleaver 2012; Hall et al. 2014) holds that newly introduced, bureaucratic institutions interact with socially embedded institutions on a local scale to produce both expected and unexpected outcomes in a governance context (De Koning 2014). This occurs in processes of institutional bricolage, when actors (bricoleurs) reject, adapt, or integrate newly introduced institutions to a set of institutions already present in their own social-ecological contexts (Cleaver and De Koning 2015). When we translate the concept of institutional bricolage to SFM implementation, we can first identify newly introduced techno-bureaucratic institutions that consist of a ‘package’ of rules, norms and ideas about SFM (Behagel et al. 2017). Second, this ‘institutional package’ interacts with a pre-existing set of socially embedded institutions as local actors adapt, reject, or integrate this package in their local practice. The social-ecological context in which forest resource uses and governance are embedded is key to this process. By analysing the social-ecological context where SFM is implemented, one can identify different groups of local actors, the socially embedded institutions (i.e. local rules, and routines), established forest uses and governance, and ecological context (Ostrom 2009). When institutions linked to SFM implementation do not connect to practices of local actors, including the social, economic, and environmental values that forest resources have for their livelihood, literature suggest a high probability that intended goals and aims will fail (McGinnis and Ostrom 2014). Moreover, certain interactions between a new set of institutions with socially embedded institutions may reinforce patterns of exclusion and vulnerabilities of local populations (Cleaver and De Koning 2015). Accordingly, the interaction between newly introduced SFM institutions and previously existing institutions entail processes of institutional bricolage that have an important impact on sustainability objectives in general and on the (dis-)empowerment of local communities in particular (Cleaver 2012; Arts and de Koning 2017). In the context of institutional bricolage linked to SFM implementation on the ground, we base our analysis on three different bricolage processes of articulation, alteration, and aggregation (De Koning and Cleaver 2012). Newly introduced institutions (i.e. SFM implementation strategies) are shaped or rejected through institutional bricolage processes by the different groups of actors on a local scale of governance. The first bricolage process of articulation is when there is local resistance to adopting a newly introduced set of institutions (De Koning and Benneker 2013). A rejection process then happens when local actors reject a new set of institutions, in our case those linked to SFM implementation strategies, as they instead affirm their pre-existing practices, cultural values, and beliefs associated with their social-ecological context. The second institutional bricolage process is ‘alteration’ (De Koning and Benneker 2013) or adaptation, when a newly introduced institution is reshaped to answer local actors’ needs or interests. This adaptation process entails the interaction between newly introduced and pre-existing institutions where some parts (but not all) of the new ‘package’ of institutions are combined with pre-existing institutions. Various groups of local actors may conduct such institutional adaptation processes differently depending on their economic, political, and social power, as well as their position in the social-ecological context. The third institutional bricolage process is ‘aggregation’ (De Koning and Benneker 2013) or integration, when newly introduced institutions positively interact with an pre-existent set of socially embedded institutions. This integration process is likely to occur when the introduction of a new set of institutions, such as those linked to SFM implementation, can be made to produce co-benefits between the aim of the introduced institutions and the pre-existing social-ecological context of local actors. It is usually accompanied by dialogue and trust building between multiple actors within and outside communities. Figure 1 summarises the analytical framework. Analytical framework: institutional bricolage of SFM implementation in a specific social-ecological context. Located in the semiarid region of north-eastern Brazil, Caatinga spans a total area of 85 million hectares of which 53% is covered by native forests (IBAMA 2011; SFB 2013) and is considered the most biodiverse tropical dry forest in the world (Moura 2010). Caatinga also encompasses the poorest region of the country (UNDP 2013) where 12.9% of the Brazilian inhabitants lives (IBGE 2010). Forest and land degradation in Caatinga, together with climate change effects – shorter rainy and longer dry seasons – make this region the most vulnerable to desertification processes in the national territory (Gutiérrez et al. 2014; Santos et al. 2014). Forest resources in Caatinga are central to the livelihoods of local populations and are also an important source of biomass for energy supply of industries, businesses, and households (Riegelhaupt and Pareyn 2010; Beuchle et al. 2015). Research focused on sustainable techniques for using native forest biomass for energy supply, developed since the 1990s (Riegelhaupt et al. 2010), has helped to define technical parameters for SFM in Caatinga. These technical parameters inspired formal regulations for the use of native forest resources focusing on wood products, such as firewood and charcoal as a source of forest biomass for regional and local energy supply. The Federal Regulation number 01 from 25th June 2009 (Brasil 2009) defines the technical and legal proceedings for the development, presentation, and implementation of a SFM plan for Caatinga. SFM of native forests in Caatinga is based on clear-cutting techniques: yearly one parcel of the total area of the SFM plan is harvested for timber; this same parcel will be harvested again only after the time needed for natural forest restoration, which is determined as a minimum of 15 years for Caatinga (Brasil 2009). The use of the managed area for other purposes, such as natural pasture for animal rearing or to collect NWFPs, is not clearly regulated, although there is an understanding that the area needs to be protected to allow forest restoration between the clear-cuttings of the management cycle. The SFM plan, which includes an inventory of the forest resources of the area and specifies the volume of forest products (wood) under management (stére/hectare/year), needs to be approved by the state environmental agency. This agency also issues the ‘Annual License for Exploitation’ or AUTEX. The federal structure of Brazil means that state’s environmental agencies articulate their own regulations on SFM based on and being equally or more restrictive than federal regulations (Brasil 2009). To trade forest products from a SFM plan, a license from the consumer’s side is required in addition to the ‘Document of Forest Product’s Origin’ (DOF) from the producer, issued by the Federal environmental agency (IBAMA). The license to consume products from a SFM plan is only awarded if the consumer, a ceramic or plaster industry for instance, adheres to a series of other formal regulations, linked to labour, commercial, industrial, and environmental laws (Brasil 2014). To support the implementation of SFM in rural settlements in Caatinga, the federal government contracts specialised organisations through public tenders for the provision of technical assistance services. These public tenders are mostly financed by the National Fund for Forestry Development (FNDF) and the Social-environmental Fund of the Federal Bank (FSACEF). They have a duration of two to three years, which most of the time only covers the elaboration and approval of the SFM plan and, in some cases, also covers the process for getting the AUTEX, the effective management of forest resources, and the trading of forest products. Since 2010, federal government increased support for SFM implementation in rural settlements in Caatinga focused on the production of wood products such as firewood, charcoal, and wood stakes. When implemented in a rural settlement and on public lands, a SFM plan also needs to be authorised by the federal government agrarian agencies and by all the families settled in the area, even by those that are not involved in the implementation of the SFM plan (Brasil 2010). We focus our analysis on the local scale of governance of SFM implementation in rural settlements in Caatinga, where four main groups of actors interact: (a) local communities living in rural settlements; (b) technicians from specialised organisations that have federal tenders to provide technical assistance services; (c) local and regional industries and businesses: the main consumers of forest biomass for energy supply; and (d) governmental actors, including state environmental agencies that approve SFM plans and issue the AUTEX and IBAMA that controls the trading of forest products from SFM plans. Our case study is based on qualitative data collected through nine local visits and twenty semi-structured interviews with individual actors, including: communities of rural settlements (producers), technicians (implementation agents), industries (consumers), environmental agencies (regulators), and central government (supporters). The locations we visited and the actors we interviewed were chosen to strongly represent the different contexts of Caatinga, as illustrated in Figure 2. In addition, we analysed literature, laws, regulations, official documents, and reports linked to SFM implementation in Caatinga. Brazilian biomes, Caatinga biome, and list of visits/interviews (names of industries, rural settlements, organisations, and interviewees were preserved). The twenty interviews were coded following an inductive approach, where bottom-up coding of the data is alternated with coding via the theoretical and analytical framework, using the three processes of institutional bricolage as sensitizing concepts (Howard-Payne 2016). The results of the analysis are organised by three themes that we identified in the data to be focal points for bricolage processes: legal and sustainable use, community social organisation, and technical assistance. The use of native forest resources for energy supply (firewood and charcoal) from illegal sources is a common practice of sellers and buyers of forest products in Caatinga. Considering the social vulnerability of local populations, selling small quantities of firewood is sometimes the only way for members of local communities to generate income in emergency situations (Riegelhaupt and Pareyn 2010). At the same time, industries and local businesses that are operating illegally due to other irregularities also continue to use forest resources from illegal sources. In this case, local populations (producers), industries, and businesses (consumers), together maintain practices of illegal and unsustainable use of native forest resources, thus ‘rejecting’ institutions regarding the implementation of SFM plans and the consumption of its products. There are situations in which a local family arrives here offering a small quantity of firewood to buy some food for their family; even if I have legal firewood to use, I buy the illegal wood mainly to help them (Interviewee-2[IND], 8). Over time, the IBAMA has increased controls and monitoring of the use of native forest as a source of biomass for energy supply in Caatinga, and industries now need to rethink their energy supply system (Interviewee-11[IND]). The increased risk of receiving fines for transporting and using illegal forest biomass put the industries in a dilemma: how to continue the use of native forests as a source of biomass for energy supply through a legal way? The use of forest biomass from SFM plans properly fits this new reality, as it is a good strategy to avoid fines. So, industries and business (consumers) adapted the use of products from SFM plans to their need to avoid fines. We decided to start getting firewood from legal sources after receiving a fine from the federal environmental agency for using firewood without the Document of Forest Product’s Origin (DOF) (Interviewee-2[IND], 2). We decided to buy firewood from a SFM plan to turn our activity legal and to avoid the risk of receiving fines (Interviewee-5[IND], 1). There are also other strategies than using firewood from SFM plans to avoid illegality: the use of forest biomass from exotic species such as Algaroba, pruning of Cajun Nuts, Mango, and urban trees; and in some cases, Eucalyptus from forest plantations. Some industries even deny the use of forest biomass from SFM plans to avoid their link to the use of native forests resources altogether; others do not stock illegal firewood from native forest to avoid fines and only maintain stocks of legal and exotic firewood or other sources of biomass. Since 2007 we do not use firewood from native forests and we do not want to work with this kind of firewood anymore. We prefer to focus on other sources of biomass, such as pruning of Cajun nuts and urban trees (Interviewee-4[IND], 2). We do not stock firewood here, only if it has the Document of Forest Product’s Origin (DOF) proving that it is from a SFM plan. If the firewood we buy is illegal, without documents, we use it the same day (Interviewee-2[IND], 8). In both cases above, industries and companies perform a rejection process regarding the use of forest biomass from SFM plans, and instead, build on other formal and informal institutions. It is clear that strategies to maintain the illegal market of products from native forests do not contribute to SFM implementation. However, there are also other factors that contribute to bricolage processes of ‘rejection’ by local actors. First, there is the lack of integration of SFM, mainly focused on the production of firewood and charcoal, with other activities that are part of the livelihood of local populations, such as animal rearing and the extraction of NWFPs. Second, to get a SFM plan approved and the AUTEX, local populations need to face bureaucratic processes that require much time and resources. Finally, to consume products from a SFM plan, the buyer also needs to adhere to industry, labour, commercial, and environmental regulations. For local populations, forest cover has a central use as a natural pasture for cattle and goat rearing, and the implementation of a SFM plan focused on producing firewood or charcoal still lacks integration of this use of native forest resources. In a SFM plan focused on firewood or charcoal production, pasture is a sub-product, and when regeneration is going well, you might insert some animals to access the pasture that is under the trees (Interviewee-13[TEC]). However, formal regulations and norms for integrating other uses of forest resources into a SFM plan are unclear or absent (Interviewee-6[TEC]). So, local populations adapt to SFM by integrating the use of forest cover as a natural pasture in a SFM plan, even if this use is not clearly regulated. We do not allow goats to enter in the area when it was just cut, but cattle there is no problem because they do not eat all the vegetation, it depends on when you allow them to enter in the area (Interviewee-10[LC], 3). Due to the bureaucratic process of getting an environmental license, local populations often do not see the implementation of a SFM plan as a feasible activity to be integrated into their production systems. Getting an environmental license for implementing a SFM plan and trading forest products legally depends on the capacity and time to deal with bureaucratic norms and regulations, which does not align with the practice of using firewood as a way to generate income rapidly. We feel lost with all this bureaucracy needed to implement a SFM plan (Interviewee-8[LC], 1). The time spent on waiting to get an environmental license is too long when we are talking about local communities with an emergency need of income generation. Local people do not understand the reasons for all these documents asked by the environmental agencies to obtain a license to do something that they already do (Interviewee-1[TEC], 3–4). Trading forest products legally also depends on the legality of the consumer. Consumers are allowed to buy firewood or charcoal from a SFM plan only if they follow industry, labour, commercial, and environmental regulations (Interviewee-2[IND]). As most of the ceramic industries and local businesses, such as bakeries and restaurants, operate illegally it is very difficult to find a legal buyer within a reasonable distance of a SFM plan. In such cases, the rejection is indirectly performed by industries and businesses (consumers) that are legally not able to buy forest biomass from a SFM plan, thus forcing local population (producers) to also reject the implementation of a SFM plan due to the lack of a legal market. Despite all the difficulties linked to the slow and bureaucratic process of obtaining an environmental license for a SFM plan, the lack of trading opportunities, and access to a legal market, SFM implementation has also achieved positive results when implemented in rural settlements in Caatinga. The first positive result is linked to local populations’ perception of environmental benefits when adopting technical parameters of a SFM plan to manage forest resources, especially because they stop following the slash-and-burn system. In this case, local populations (producers) are able to integrate SFM practices in their own practices producing co-benefits for their environment. When you compare the area where we managed forests according to the technique of a SFM plan with areas where we used to set fire, the differences are amazing. The sprouting of the vegetation in managed areas make you understand why it is not good to set fire (Interviewee-7[LC], 6). When you do not set a fire in the area you can notice a faster and better regeneration, and the vegetation grows better also because if you insert some animals they are not going to damage the soil as they would do in areas where you set fire (Interviewee-10[LC], 4). The second positive result is linked to the fact that not having an environmental license for a SFM plan does not mean that forest resources are being managed in an unsustainable way. There are cases where a local population adopted technical parameters of SFM while continuing to manage forest resources without having the environmental license. In this case, even though the use of forest resources was not turned into a legal activity, local communities (producers) integrate SFM with the pre-existing practice of using forest resources as a source of income generation. While a community was waiting for the authorisation to manage forest resources in their SFM plan, a local ceramic industry offered to buy all their firewood. They decided to accept the risk of selling it without the environmental license, but followed all the technical parameters for managing the forest resource that they already knew from the previous years (Interviewee-1[TEC], 3). Local populations link a third important benefit of SFM to the use of forest resources as part of a saving system in emergency situations: they cite income generation as its most positive result (Interviewee-1[TEC]). If you plant some corn, for instance, on January you are going to make money from it only on September or October, and between planting and selling, you are going to spend a lot of time working to maintain the plantation. With the charcoal, we have a lot of work as well, but every week you can make money from it; with agriculture is not like this (Interviewee-8[LC], 2). We do other things here such as goat rearing and some agriculture, but the money that is guaranteed is the one from the SFM plan (Interviewee-9[LC], 7). SFM fits community needs when it is part of a saving system. When they get the AUTEX, communities usually do not manage all the forest resource of that parcel of the SFM plan at once; they spread the management of small quantities along the time of the license, making it a steady source of income. This strategy is an example of a bricolage adaptation process, when local populations adapt SFM according to their needs and as part of a saving system for emergency needs and situations. The SFM plan is like saving, the wood is there. If you need some money you can go there and cut firewood from the area that has the license in that year, and sometimes in the dry seasons, this money also serves to feed animals (Interviewee-9[LC], 7). SFM implementation in rural settlements in Caatinga is strongly linked to the social organisation of local communities. We found major differences in the way in which local communities distribute the areas of the SFM plan, share benefits from a SFM plan, and organise the workforce for its implementation. In rural settlements they spread the areas that are part of a SFM plan in two different ways: they are either equally spread in the individual areas of the families that are involved with the SFM plan, or they are implemented in a collective area where productive activities need to be approved by – and benefit – all families. When forest cover is spread over different patches, spreading the area of a SFM plan into individual parcels might solve two problems at once, the division of the workforce and the division of the profit from the SFM plan (Interviewee-3[LC]). When the SFM plan is spread over individual parcels, its implementation is ‘integrated’ with local communities’ custom to divide the work and the benefits from it. When SFM plans are implemented in a collective area, usually the case when a continuous forest cover is present, they have to face the problem of how to equally benefit all the families that are part of the rural settlement. One of the solutions is dividing the profit differently amongst people that directly work on the SFM plan and people that, despite not working on the SFM plan, have authorised the use of a collective area for its implementation. In this case, local communities ‘adapt’ the implementation of a SFM plan through pre-existing practices of sharing benefits differently amongst different degrees of participation, while also maintaining the collective benefit of the activity. The rural settlement has 23 families and only 10 are involved with the SFM plan. The counterpart for who is not involved is that we transfer 10% of the profit of the SFM plan directly to the common association (Interviewee-7[LC], 2). I am not part of the SFM plan, however, a percentage of their profits go to our association. This income is good because I do not have to use my money to pay the fees and other things that the association needs to pay (Interviewee-15[LC], 7). A collective activity also brings problems linked to the division of the workforce while managing the parcels of SFM plans: should all the people that are involved work together and at the same time? How to solve the differences in work rhythm and individual productivity? One of the solutions is to divide the collective areas into individual parcels and distribute them amongst people that are directly involved in the SFM plan. In this case, local communities ‘integrate’ the implementation of a SFM plan with the strategy of dividing the work force while implementing a collective activity. In the beginning, we started cutting as a collective work but did not work well because inside the group there is always someone not working as the others, and when the time arrives to share the profit they want to receive the same amount. We decided to divide the area and then each one could work in their own rhythm (Interviewee-9[LC], 1–2). After being challenged by both problems, division of the managed area and of the workforce needed for implementing a SFM plan, one of the rural settlements found an alternative solution: they pay a third party for managing forest resources that are part of the SFM plan. In other words, they authorise the implementation of SFM in their common area but a third party provides the labour, and these are often the same people that buy the firewood. In this case, local communities ‘adapt’ their social organisation concerning a SFM plan by contracting a third party for labour, sharing the benefits from the SFM plan equally amongst all the settled families. We started cutting the firewood ourselves, but then it was confusing, people were cutting more than others. We decided to sell to someone that could come here, cut, load the truck and pay us a fixed price (Interviewee-10[LC], 3). Another important issue involving the social organisation of local communities is linked to their ability to develop a trading plan for products from a SFM plan, and consequently, access to the market. Besides elaborating the SFM plan, getting the environmental license and managing forest resources, implementing SFM also involves decisions on what should be the trading strategy and how to access the market. Most of the local farmers are not integrated into the market; they do not have trading experience. They could add more value to their products selling charcoal directly to restaurants, for instance (Interviewee-12[TEC], 5). A central figure is present in all the visited rural settlements with experiences on SFM implementation: a jobber. The jobber makes the connection between those who have a legal forest biomass to sell and those who are legally able to buy it. The uncertainty about the time spent to get an environmental license does not allow producers to make deals directly with consumers because the former might not be able to guarantee a constant offer of firewood for the market. In this situation, the jobber is the only one capable of organising the offer and the demand amongst different producers and buyers. Thus, local communities ‘adapt’ SFM by using a common practice to face the instability of its implementation: the presence of a jobber connecting producers and consumers. We have difficulty to sell a constant quantity to the industry; we cannot guarantee that we are going to have the exact quantity that they need every day. Consequently, we sell our firewood to a jobber that sells it to a ceramic industry. We do not have a contract with the ceramic industry, it is the jobber that has it (Interviewee-9[LC], 5–6). In Caatinga, governmental support for SFM implementation through public tenders is not integrated in other rural assistance programmes and, thus, is not continuous over time. On the one hand, the strategy of contracting specialised services through public tenders guarantees technical assistance for SFM implementation in rural settlements. On the other hand, the discontinuation of technical assistance services that are not part of a long-term governmental programme of rural technical assistance makes it difficult to guarantee the continuous implementation of a SFM plan, and thus its credibility for local communities. When they arrived with this thing of a SFM plan we thought that it would not work for us; we did not believe in this possibility. And then after a while, they came again making some studies and suddenly disappeared. They took one year to come back, and at this point, we did not believe in it anymore (Interviewee-8[LC], 1). In some cases, industries directly support implementation of SFM plans in areas of private owners by paying technical assistance services, while the owner of the area agrees on selling the firewood exclusively to this industry (Interviewee-2[IND]). As part of this arrangement, the same specialised technicians that are part of government initiatives are paid by industries to offer their services for SFM implementation in privately owned areas (Interviewee-1[TEC]). In this case, industries and businesses (consumers), through an arrangement with technicians (implementers), ‘adapt’ the implementation of SFM in the absence of effective governmental support. The private hiring of technicians to draft SFM plans contributes to a continuous production of firewood through sustainable practices, guaranteeing the offer of forest biomass for industry and business energy supply. However, this kind of agreement between industries, technicians, and private owners does not contribute to income generation for vulnerable local populations, such as those living in rural settlements. In this case, social exclusion of vulnerable populations from forest benefits is strengthened through bricolage processes. Moreover, the arrangement between industries, private owners, and technicians is also exposed to difficulties linked to the slow processes for getting an environmental license and depends on a relation with a private owner that is not always easy to maintain. The ideal would be to put together four or five ceramic industries to support one big SFM plan, but this depends on the owners of the areas where we could implement a SFM plan (Interviewee-5[IND], 3). Here in the region, there is no private property with a dimension that could fit a SFM plan, so you need to put together four or five properties to establish a SFM plan. It is very hard, first, to convince different owners, and then, to maintain the agreement for the implementation of such a SFM plan (Interviewee-2[IND], 4). In the case of rural settlements, due to the slow bureaucratic process of approving a SFM plan and getting the AUTEX, in most of the cases, technical assistance provided by governmental initiatives finishes before it is possible to harvest the first parcel of a SFM plan. In this case, local communities use two different strategies. The first one is making an agreement directly with the buyer and including in the selling price the needed technical assistance for obtaining the approval of a SFM plan and the AUTEX. We implemented seven SFM plans in rural settlements and only two of them worked out because the families decided to pay for technical assistance together with the buyer, which included it in the final price. The other five plans did not work out after the project of technical assistance finished (Interviewee-6[TEC], 3). When the project that helped us to start the SFM plan is finished we are planning to continue; we are talking with other rural settlements to organise that the buyer pays the technicians that need to sign and send the documents to the environmental agency, and the association pays only the fees of the licensing process (Interviewee-7[LC], 2). A second alternative that local communities have to deal with the discontinuation of technical assistance services is to make an agreement directly with the technicians. Local communities that have some resources pay specialised organisations for the provision of technical assistance services when their contracts with the government are finished. We are finishing a contract of technical assistance now in a group of rural settlements, but I am already talking with them to continue offering my services and they will pay me through their association. I can ask a much lower price because it is less work than when we work through a programme or a project, we are already used to the SFM plan, the area, and the people (Interviewee-6[TEC], 7). In both cases, local communities ‘adapt’ the implementation of SFM to the discontinuation or the lack of technical assistance provided by governmental initiatives, obtaining it directly from the buyer of the forest products of the SFM plan, or from specialised organisations that were part of governmental initiatives. In some cases, these specialised organisations and their technicians also play the role of jobber, intermediating between local communities, environmental agencies, and buyers and, in doing so, having financial benefits. In this sense, a SFM plan, even if implemented in a rural settlement and consequently benefiting local communities, is part of a business plan, and once the organisation does not see it as an opportunity to generate income, they can suddenly abandon it. The person who was giving us technical assistance as part of these governmental programme funded a small company that now offers the service of doing everything, from the SFM plan to the process of getting the environmental license, organising the management, and selling it (Interviewee-3[LC], 3). The company that was elaborating the SFM plan for us, managing its parcels, and selling its products, does not see it as an opportunity anymore because in the last time they earned less money than they were expecting (Interviewee-3[LC], 3). In one of the cases, a specialised organisation elaborated a project funded by the central government that was specifically focused on training local communities for simple technical tasks. The training was focused on measuring the parcel and making all the technical calculations required for obtaining the AUTEX. The organisation that carried out this project was previously involved in other governmental initiatives to support SFM implementation in rural settlements. This organisation concluded that training local populations for the basic technical work would increase the possibility of continuing the implementation of the SFM after federal assistance ends. This is an example where technicians (implementers) tried to ‘integrate’ the implementation of SFM in local practice by training local communities on technical tasks that are needed for requesting the AUTEX. I was part of a course where they taught us how to use the GPS and how to measure the area each year, and then I can make all the measurements that need to be done here in the area (Interviewee-9[LC], 2–3). Even if the local community has some technical capacity to deal with bureaucratic processes, an engineer is still needed to sign and submit documents, and to monitor the bureaucratic processes, thus making the connection between the local community and the environmental agency. To cover the inability of local communities to deal with bureaucratic processes, one local community has an informal agreement with a non-governmental organisation that previously gave them the technical assistance as part of a governmental initiative. In this informal agreement, the local community sends all the measurements made in the field to the technicians, who then elaborate the reports and sign the technical documents to be sent to the environmental agency. As he [community member] is able to make all the measurements of the area and to collect all the data needed to request the annual license [AUTEX], they send us the data and we can elaborate the report and submit it in the environmental agency, it is a collaboration (Interviewee-14[TEC], 12). The organisation made an agreement with us that they are going to support how they can, and if needed they will make this bridge between us and the environmental agency; we also do not have to pay an engineer to sign the papers, and they already know the area and how the things work here (Interviewee-9[LC], 13). In this case, local communities and technicians made an informal agreement to ‘adapt’ the implementation of a SFM plan to the lack of capacity and resources of local communities to deal with bureaucratic processes. 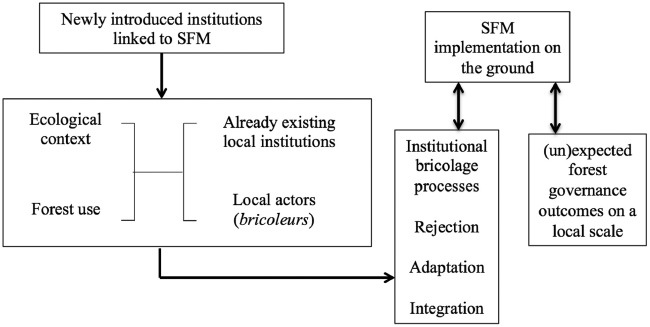 Our results confirm that outcomes from local SFM implementation are mainly shaped by institutional bricolage processes of rejection, adaptation, and integration performed by local actors (Cleaver and De Koning 2015). In Caatinga, bricolage processes of rejection are mainly linked to the maintenance of local practices linked to the illegal use and trade of native forest resources. Difficulties in following regulations either for implementing SFM or for buying firewood and charcoal from SFM plans, together with the fact that selling firewood illegally is sometimes the only way for local communities to generate income rapidly, strengthens the illegal market of firewood from native forests in Caatinga. In Caatinga, multiple adaptation bricolage processes occur linked to the maintenance of local practices while implementing SFM, such as using managed areas as natural pasture for animal rearing, which is not clearly regulated by SFM formal institutions. An institutional adaptation process also occurs when local communities contract a third party (often a jobber) to do all the work linked to the SFM plan and to the trading of forest products, through an informal leasehold mechanism. Less sustainable forms (or more exclusionary) of adaptation processes happen when SFM implementation is decided on by industry and technical consultancy firms that mostly follow market rationales and fail to take local livelihoods into account. Finally, results show that a more sustainable outcome of SFM implementation happens in general when local actors integrate not only the technical, but also the social and environmental elements of SFM (Behagel et al. 2017). In particular, this means that various actors work together towards a commonly shared objective. In Caatinga, such institutional integration was seen to happen when consumers (industries) and technicians (implementers) work together with local communities (producers) to cover the lack of a continuous technical support from government, or to address the bureaucratic processes of requesting the AUTEX for a SFM plan. Social-ecological context was seen to shape local SFM implementation by influencing bricolage processes (Ostrom 2009; Hinkel et al. 2014; McGinnis and Ostrom 2014). In Caatinga, SFM implementation strategies are mainly focused on the use of native forest resources as a source of biomass for energy supply to local industries and businesses. The lack of consideration of other economic roles that native forest resources have in the livelihoods of local actors – in the case of Caatinga, as a natural pasture or as a source of NWFP for local communities – can be directly linked to both bricolage processes of rejection and adaptation, as described above. Accordingly, SFM institutions do not reach their full potential in Caatinga because they do not take the full range of forest uses into account. In addition to a narrow view on resource use, the SFM package introduced in Caatinga broadly fails to include important governance aspects of the social-ecological context. In particular, SFM implementation strategy in Caatinga does not focus on three important types of socially embedded institutions: the illegal market of native forest products; the social organisation of local communities; and the lack of integration of SFM in other governmental rural technical assistance programs. The lack of consideration of the specificities of resource use and governance within the social-ecological context of Caatinga implies that SFM implementation strategies will unlikely achieve environmental, social, and economic goals simultaneously as the tendency by local actors to reject SFM institutions is increased. Local communities are increasingly being considered a key-factor to the success of strategies that aim for more sustainable management of forests (Persha et al. 2011; Arts and de Koning 2017). Our results show that local actors indeed play a key role in managing forest commons. They do so, first, by legitimizing institutions in their daily practices, and second, by adapting institutions according to their social values and beliefs (Agrawal 2007; Cleaver 2012). Our results particularly highlight the importance of local social arrangements amongst various groups of local actors (De Koning and Benneker 2013). Increasing levels of acceptance of newly introduced institutions in bricolage processes were generally seen to follow from increased interactions between a variety of local actors, including technicians, jobbers, industries, communities, and so on. In Caatinga, the lack of participation of local communities in the development of the original SFM package is reflected in its many bureaucratic hurdles and a dominant focus on biomass for energy supply. On a broader scale, strategies aiming for the sustainable use of environmental resources still lack an integration of local norms and cultural values, which would be achieved through a better consideration of interactions amongst different groups of local actors (Merrey and Cook 2012). In the case of Caatinga, this lack arises from the fact that SFM implementation strategies are based on the interests and ideas of only two groups of actors: federal government and international organisations that seek to decrease deforestation and forest degradation, and local industries and businesses that need to guarantee their source of biomass for energy supply. First, we conclude that formal institutions linked to SFM implementation strategies fail to convincingly connect to the different roles that native forest resources have in a specific social-ecological context. In the case of Caatinga, a Brazilian government research initiative successfully addressed one of the main causes of deforestation in the biome – the use of native forest resources as a source of biomass for energy supply – through developing technical parameters of SFM for this purpose. The focus of SFM implementation strategies on the production of forest biomass in Caatinga is at the same time a clear example of how the use of native forest resources directly linked to forest loss is targeted over other uses of native forest resources that are linked to livelihoods of local populations, overshadowing their role in and potential for being key actors in the sustainable use of forest resources (Agrawal 2007). This lack of consideration of other roles that native forest resources have in the livelihoods of local populations – in the case of Caatinga as a natural pasture or as a source of NWFP – shows how the specificities of the social-ecological context in the design of SFM implementation strategies are often left outside consideration (Ostrom 2009; Hinkel et al. 2014). In turn, this can lead to exclusion of vulnerable populations and general implementation failure. Our second conclusion is that the success of sustainably managing forest resources that are under a common pool of local communities is closely dependent on the way in which their social-ecological context is considered (McGinnis and Ostrom 2014; Monroy-Sais et al. 2016), which also depends on the participation of a broad range of local actors in the design and formulation of SFM implementation strategies (Agrawal et al. 2013; Barnes et al. 2017; Le Tourneau and Beaufort 2017). Moreover, success of participation also depends on the social organisation of local actors amongst themselves, i.e. the arrangements between different groups of local actors aiming to improve the social network linked to forest resources uses (Arts and de Koning 2017). Finally, we understand that institutional bricolage processes are performed not only by local communities, but also by other groups of local actors linked to markets and services accessed by these communities. Bricolage processes linked to SFM implementation in Caatinga biome are articulated by different groups of actors performing locally, such as local communities (producers), industries (consumers) and technicians (providers of technical services). We therefore recommend that policy-makers place more effort on keeping formal institutions flexible enough to consider the social-ecological context in which SFM is implemented. This means placing focus not only on the different uses of native forests that are part of local livelihoods and local markets, but also to consider the importance of a diverse group of local actors for successful SFM implementation, including technicians, jobbers, consumers, restaurants, and industries, in addition to the central role that local communities should play. The authors thank all the people interviewed for this research, especially local community members. The authors also thank the two anonymous reviewers for their very helpful suggestions. This research was funded by the CAPES Foundation (Brazil), grant number 09106/2013-08. Agrawal, A (2007). Forests, Governance, and Sustainability: Common Property Theory and its Contributions. International Journal of the Commons 1(1): 111–136. DOI: http://dx.doi.org/10.18352/ijc.10. Agrawal, A, Brown, D. G, Rao, G, Riolo, R, Robinson, D. T and Bommarito, M (2013). Interactions between Organizations and Networks in Common-Pool Resource Governance. Environmental Science & Policy 25: 138–146. DOI: http://dx.doi.org/10.1016/j.envsci.2012.08.004. Arts, B and Buizer, M (2009). Forests, Discourses, Institutions. Forest Policy and Economics 11(5–6): 340–347. DOI: http://doi.org/10.1016/j.forpol.2008.10.004. Arts, B and de Koning, J (2017). Community Forest Management: An Assessment and Explanation of its Performance Through QCA. World Development 96: 315–325. DOI: http://doi.org/10.1016/j.worlddev.2017.03.014. Bakke, O. A, Pereira Filho, J. M, Bakke, I. A and Cordão, M. A (2010). Gariglio, M. A, d. S. B. Sampaio, E. V, Cestaro, L. A and Kageyama, P.Y. eds. Produção e utilização da forragem de espécies lenhosas da Caatinga. Uso sustentável e conservação dos recursos florestais da Caatinga, : 160–179. Brasília: Ministério do Meio Ambiente. ISBN: 978-85-63269-04-1. [Available online]: http://www.mma.gov.br/estruturas/sfb/_arquivos/web_uso_sustentvel_e_conservao_dos_recursos_florestais_da_caatinga_95.pdf (Acessed on 5th October 2017). Barnes, C, Claus, R, Driessen, P, Ferreira Dos Santos, M. J, George, M. A and Van Laerhoven, F (2017). Uniting Forest and Livelihood Outcomes? Analyzing External Actor Interventions in Sustainable Livelihoods in a Community Forest Management Context. International Journal of the Commons 11(1): 532–571. DOI: http://doi.org/10.18352/ijc.750. Behagel, J. H, Arts, B and Turnhout, E (2017). Beyond Argumentation: A Practice-Based Approach to Environmental Policy. Journal of Environmental Policy & Planning, : 1–13. [online] DOI: http://dx.doi.org/10.1080/1523908X.2017.1295841. Bernstein, S and Cashore, B (2012). Complex Global Governance and Domestic Policies: Four Pathways of Influence. International Affairs 88(3): 585–604. DOI: http://doi.org/10.1111/j.1468-2346.2012.01090.x. Beuchle, R, Grecchi, R. C, Shimabukuro, Y. E, Seliger, R, Eva, H. D, Sano, E and Achard, F (2015). Land Cover Changes in the Brazilian Cerrado and Caatinga Biomes from 1990 to 2010 Based on a Systematic Remote Sensing Sampling Approach. Applied Geography 58: 116–127. DOI: http://doi.org/10.1016/j.apgeog.2015.01.017. Brasil. Dispõe sobre procedimentos técnicos para elaboração, apresentação, execução e avaliação técnica de Planos de Manejo Florestal Sustentável (PMFS) da Caatinga e suas formações sucessoras. Instrução Normativa n° 1, de 25 de junho de 2009. Diário Oficial da União (DOU) n° 120, de 26 de Maio de 2009, seção 1, 93–95. Brasília: Governo Federal Brasileiro. [Available online]: http://pesquisa.in.gov.br/imprensa/jsp/visualiza/index.jsp?data=26/06/2009&jornal=1&pagina=93&totalArquivos=184 (Accessed on 5th October 2017). Brasil. Estabelece crite?rios e procedimentos para as atividades de Manejo Florestal Sustenta?vel em Projetos de Assentamento. Instrução Normativa INCRA n° 65, de 27 de outubro de 2010. Diário Oficial da União (DOU) n° 251, de 31 de Dezembro de 2010, seção 1, 136–139. Brasília: Governo Federal Brasileiro. [Available online]: http://pesquisa.in.gov.br/imprensa/jsp/visualiza/index.jsp?jornal=1&pagina=136&data=31/12/2010 (Accessed on 5th October 2017). Brasil. Sistema Nacional de Controle da Origem dos Produtos Florestais - Sinaflor. Instrução Normativa IBAMA n° 21, de 23 de dezembro de 2014. Diário Oficial da União (DOU) n° 249, de 24 de Dezembro de 2014, seção 1, 102–107. Brasília: Governo Federal Brasileiro. [Available online]: http://pesquisa.in.gov.br/imprensa/jsp/visualiza/index.jsp?jornal=1&pagina=102&data=24/12/2014 (Accessed on 5th October 2017). Cleaver, F (2012). Development Through Bricolage: Rethinking Institutions for Natural Resource Management. London: Routledge, Taylor & Francis Group. ISBN: 978-1-84407-868-4 (hbk). Cleaver, F and De Koning, J (2015). Furthering Critical Institutionalism. International Journal of the Commons 9(1): 1–18. DOI: http://doi.org/10.18352/ijc.605. de Araújo Filho, J. A (2013). Iñiguex Rojas, L ed. Propuestas tecnológicas para el manejo de la vegetación de la caatinga con fines pastoriles. La producción de rumiantes menores en las zonas áridas de Latinoamerica. : 281–294. Brasília: Embrapa. ISBN: 978-85-7035-229-3. [Available online]: https://ainfo.cnptia.embrapa.br/digital/bitstream/item/101893/1/PL-Propuestas-tecnologicas.pdf (Accessed on 5th October 2017). De Koning, J (2014). Unpredictable Outcomes in Forestry – Governance Institutions in Practice. Society & Natural Resources 27(4): 358–371. DOI: http://dx.doi.org/10.1080/08941920.2013.861557. De Koning, J and Cleaver, F (2012). Arts, B, v. Bommel, S, Ros-Tonen, M and Verschoor, G. eds. Institutional Bricolage in Community Forestry: An Agenda for Future Research. Forest-People Interfaces. : 277–290. Wageningen: Wageningen Academic Publishers. DOI: https://dx.doi.org/10.3920/978-90-8686-749-3. De Koning, J and Benneker, C (2013). Arts, B, Behagel, J, van Bommel, S, de Koning, J and Turnhout, E. eds. Bricolage Practices in Local Forestry. Forest and Nature Governance: A Practice Based Approach. : 49–67. Springer Netherlands: Dordrecht. DOI: http://doi.org/10.1007/978-94-007-5113-2_3. Gutiérrez, A. P. A, Engle, N. L, De Nys, E, Molejón, C and Martins, E. S (2014). Drought Preparedness in Brazil. Weather and Climate Extremes 3: 95–106. DOI: http://dx.doi.org/10.1016/j.wace.2013.12.001. Hall, K, Cleaver, F, Franks, T and Maganga, F (2014). Capturing Critical Institutionalism: A Synthesis of Key Themes and Debates. The European Journal of Development Research 26(1): 71–86. DOI: http://doi.org/10.1057/ejdr.2013.48. Hinkel, J, Bots, P and Schlüter, M (2014). Enhancing the Ostrom Social-Ecological System Framework through Formalization. Ecology and Society 19(3): 51. DOI: http://dx.doi.org/10.5751/ES-06475-190351. Howard-Payne, L (2016). Glaser or Strauss? Considerations for Selecting a Grounded Theory Study. South African Journal of Psychology 46(1): 50–62. DOI: http://doi.org/10.1177/0081246315593071. IBAMA. Monitoramento do Desmatamento na Caatinga 2008–2009. Brasília: Ministério do Meio Ambiente, [Available online]: http://www.mma.gov.br/estruturas/sbf_chm_rbbio/_arquivos/relatorio_tecnico_caatinga_2008_2009_72.pdf (Accessed on 5th October 2017). IBGE. Censo Demográfico Nacional 2010. Brasília: Instituto Brasileiro de Geografia e Estatística – IBGE. ISSN: 0104-3145, [Available online]: http://biblioteca.ibge.gov.br/visualizacao/periodicos/93/cd_2010_caracteristicas_populacao_domicilios.pdf (Accessed on 5th October 2017). IUFRO. Seppălă, R, Buck, A and Katila, P eds. (2009). Making Forest fit for Climate Change. Oulu: Ministry for foreign affairs of Finland and International Union of Forest Research Organizations (IUFRO). ISBN: 978-3-901347-82-5. [Available online]: https://www.iufro.org/download/file/26204/4496/Policy_Brief_ENG_final_pdf/ (Accessed on 5th October 2017). Le Tourneau, F.-M. and Beaufort, B. (2017). Exploring the Boundaries of Individual and Collective Land use Management: Institutional Arrangements in the PAE Chico Mendes (Acre, Brazil). International Journal of the Commons 11(1): 70. DOI: http://doi.org/10.18352/ijc.589. Locatelli, B, Brockhaus, M, Buck, A and Thompson, I (2010). Mery, G, Katila, P, Galloway, G, Alfaro, R. I and Kanninen, M. eds. Forests and Adaptation to Climate Change: Challenges and Opportunities. Forests and Society – responding to Global Drivers of Change. : 21–42. Vienna: International Union of Forest Research Organization (IUFRO). ISBN: 978-3-901347-93-1. [Available online]: https://www.iufro.org/science/special/wfse/forests-society-global-drivers/ (Accessed on 04th December 2017). McGinnis, M and Ostrom, E (2014). Social-Ecological System Framework: Initial Changes and Continuing Challenges. Ecology and Society 19(2): 30. DOI: http://dx.doi.org/10.5751/ES-06387-190230. Merrey, D. J and Cook, S (2012). Fostering Institutional Creativity at Multiple Levels: Towards Facilitated Institutional Bricolage. Water Alternatives 5(1): 1–19. [Available online]: http://www.water-alternatives.org/index.php/alldoc/articles/vol5/v5issue1/154-a5-1-1/file (Accessed on 12th June 2018). Monroy-Sais, S, Castillo, A, García-Frapolli, E and Ibarra-Manríquez, G (2016). Ecological Variability and Rule-Making Processes for Forest Management Institutions: A Social-Ecological Case Study in the Jalisco Coast, Mexico. International Journal of the Commons 10(2): 1144. DOI: http://doi.org/10.18352/ijc.672. Moura, A. S. S (2010). Gariglio, M. A, d. S. B. Sampaio, E. V, Cestaro, L. A and Kageyama, P. Y eds. Reserva da Biosfera da Caatinga. Uso Sustenta?vel e Conservac?a?o dos Recursos Florestais da Caatinga. : 82–96. Brasília: Ministério do Meio Ambiente. ISBN: 978-85-63269-04-1. [Available online]: http://www.mma.gov.br/estruturas/sfb/_arquivos/web_uso_sustentvel_e_conservao_dos_recursos_florestais_da_caatinga_95.pdf (Accessed on 5th October 2017). Ostrom, E (1992). Institutions and Common-Pool Resources. Journal of Theoretical Politics 4(3): 243–245. DOI: https://doi.org/10.1177/0951692892004003001. Ostrom, E (2009). A General Framework for Analyzing Sustainability of Social-Ecological Systems. Science 325(5939): 419–422. DOI: http://doi.org/10.1126/science.1172133. Pareyn, F. G. C (2010). Gariglio, M. A, d. S. B. Sampaio, E. V, Cestaro, L. A and Kageyama, P. Y eds. Os recursos florestais nativos e sua gestão no estado do Pernambuco – o papel do Manejo Florestal Sustentável. Uso Sustenta?vel e Conservac?a?o dos Recursos Florestais da Caatinga. : 99–113. Brasília: Ministério do Meio Ambiente. ISBN: 978-85-63269-04-1. [Available online]: http://www.mma.gov.br/estruturas/sfb/_arquivos/web_uso_sustentvel_e_conservao_dos_recursos_florestais_da_caatinga_95.pdf (Acessed on 5th October 2017). Persha, L, Agrawal, A and Chhatre, A (2011). Social and Ecological Synergy: Local Rulemaking, Forest Livelihoods, and Biodiversity Conservation. Science 331(6024): 1606–1608. DOI: http://doi.org/10.1126/science.1199343. Rametsteiner, E (2009). Governance Concepts and their Application in Forest Policy Initiatives from Global to Local Levels. Small-Scale Forestry 8(2): 143–158. DOI: https://doi.org/10.1007/s11842-009-9078-2. Richards, M (1997). Common Property Resource Institutions and Forest Management in Latin America. Development and Change 28(1): 95–117. DOI: http://doi.org/10.1111/1467-7660.00036. Riegelhaupt, E. M and C. Pareyn, F. G (2010). Gariglio, M. A, d. S. B. Sampaio, E. V, Cestaro, L. A and Kageyama, P. Y eds. A Questão Energética. Uso Sustenta?vel e Conservac?a?o dos Recursos Florestais da Caatinga. : 65–75. Brasília: Ministério do Meio Ambiente. DOI: 978-85-63269-04-1. [Available online]: http://www.mma.gov.br/estruturas/sfb/_arquivos/web_uso_sustentvel_e_conservao_dos_recursos_florestais_da_caatinga_95.pdf (Acessed on 5th October 2017). Riegelhaupt, E. M, Pareyn, F. G. C and Bacalini, P (2010). Gariglio, M. A, d. S. B. Sampaio, E. V, Cestaro, L. A and Kageyama, P. Y eds. O Manejo Florestal na Caatinga: Resultados da Experimentação. Uso Sustenta?vel e Conservac?a?o dos Recursos Florestais da Caatinga. : 256–275. Brasília: Ministério do Meio Ambiente. ISBN: 978-85-63269-04-1. [Available online]: http://www.mma.gov.br/estruturas/sfb/_arquivos/web_uso_sustentvel_e_conservao_dos_recursos_florestais_da_caatinga_95.pdf (Acessed on 5th October 2017). Santos, M. G, Oliveira, M. T, Figueiredo, K. V, Falcao, H. M, Arruda, E. C. P, Almeida-Cortez, J, Sampaio, E. V. S. B, Ometto, J. P. H. B, Menezes, R. S. C and Oliveira, A. F. M (2014). Caatinga, the Brazilian dry Tropical Forest: Can it Tolerate Climate Changes?. Theoretical and Experimental Plant Physiology 26(1): 83–99. DOI: http://doi.org/10.1007/s40626-014-0008-0. Scott, W. R (2010). Reflections: The Past and Future of Research on Institutions and Institutional Change. Journal of Change Management 10(1): 5–21. DOI: https://doi.org/10.1080/14697010903549408. SFB. Florestas do Brasil em Resumo – 2013 ed SFB, Brasília: Serviço Florestal Brasileiro / Ministério do Meio Ambiente: ISBN: 978-85-63269-10-2. [Available online]: http://www.florestal.gov.br/snif/images/Publicacoes/florestas_do_brasil_em_resumo_2013_atualizado.pdf (Accessed on 5th October 2017). UNDP. Chediek, J, Peral, A, Neri, M. C and Chaves, M eds. (2013). O Índice de Desenvolvimento Humano Municipal Brasileiro. Atlas do Desenvolvimento Humano no Brasil 2013. Brasília: United Nations Development Program (UNDP), Instituto de Pesquisa Econômica Aplicada (IPEA), and Fundação João Pinheiro (FJP). ISBN: 978-85-7811-171-7. [Available online]: http://atlasbrasil.org.br/2013/data/rawData/publicacao_atlas_municipal_pt.pdf (Accessed on 5th October 2017). Wagner, S, Nocentini, S, Huth, F and Hoogstra-Klein, M (2014). Forest Management Approaches for Coping with the Uncertainty of Climate Change: Trade-Offs in Service Provisioning and Adaptability. Ecology and Society 19(1): 32. DOI: http://doi.org/10.5751/ES-06213-190132. Interviewee-1[TEC]. Technician of a non-governmental organisation. Transcription from the original language. Patos, PB, Brasil: Portuguese. April 04th, 2017. Interviewee-2[IND]. Owner of a ceramic industry. Transcription from the original language. Santa Cruz, PB, Brasil: Portuguese. April 05th, 2017. Interviewee-3[LC]. Community member of a rural settlement. Transcription from the original language. São Mamede, PB, Brasil: Portuguese. April 05th, 2017. Interviewee-4[IND]. Owner of a ceramic industry. Transcription from the original language. Parelhas, RN, Brasil: Portuguese. April 06th, 2017. Interviewee-5[IND]. Owner of a ceramic industry. Transcription from the original language. Parelhas, RN, Brasil: Portuguese. April 06th, 2017. Interviewee-6[TEC]. Technician of a non-governmental organisation. Transcription from the original language. Fortaleza, CE, Brasil: Portuguese. Interviewee-7[LC]. Community member of a rural settlement. Transcription from the original language. Canindé, CE, Brasil: Portuguese. April 11th, 2017. Interviewee-8[LC]. Community member of a rural settlement. Transcription from the original language. Canindé, CE, Brasil: Portuguese. April 11th, 2017. Interviewee-9[LC]. Community member of a rural settlement. Transcription from the original language. Floresta, PE, Brasil: Portuguese. April 17th, 2017. Interviewee-10[LC]. Community member of a rural settlement. Transcription from the original language. Ingazeira, PE, Brasil: Portuguese. April 18th, 2017. Interviewee-11[IND]. Owner of a plaster industry. Transcription from the original language. Trindade, PE, Brasil: Portuguese. April 19th, 2017. Interviewee-12[TEC]. Technician of a non-governmental organisation. Transcription from the original language. Fortaleza, CE, Brasil: Portuguese. April 10th, 2017. Interviewee-13[TEC]. Field technician of a non-governmental organisation. Transcription from the original language. Canindé, CE, Brasil: Portuguese. April 11th, 2017. Interviewee-14[TEC]. Field technician of a non-governmental organisation. Transcription from the original language. Floresta, CE, Brasil: Portuguese. April 17th, 2017. Interviewee-15[LC]. Community member of a rural settlement. Transcription from the original language. Floresta, PE, Brasil: Portuguese. April 17th, 2017.